The poster for "Mississippi Grind" might as well have a "40th anniversary!" logo. It feels so much like a lost American drama from 1975 (the year of "Nashville," "One Flew Over the Cuckoo's Nest" and "Shampoo") that the filmmakers could've gone ahead and set it in the period and outfitted the actors with wide lapel shirts and pants with flared legs. This story of two losers gambling their way across America is a nostalgia act in the best way: it brings back aesthetic values that certain American filmmakers, writers and actors of the '70s embodied brilliantly and could showcase on a grand stage, because at that time the cinematic marketplace still allowed small-scaled films about people living small-scaled lives to get national theatrical releases, and serious attention, rather than dumping them to one or two theaters plus DVD or iTunes. There are even cameos by James Toback—who wrote and directed the 1974 version of "The Gambler," a film to which "Mississippi Grind" owes a debt—and by Warren Beatty's Nixon-era hairdo, which is perched atop costar Ben Mendelsohn's furtively bowed head. 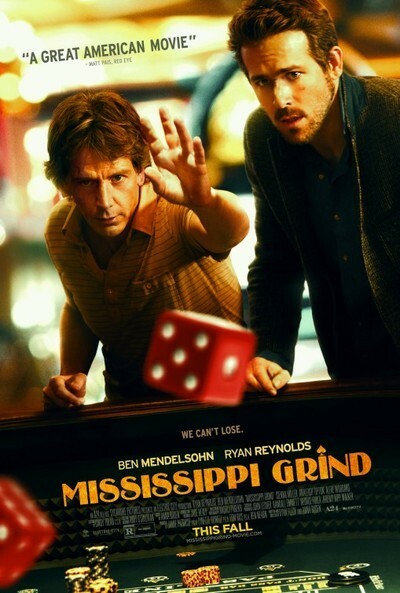 "Mississippi Grind" is co-written and co-directed by Anna Boden and Ryan Fleck, the team behind the similarly '70s-influenced "Half Nelson" and "Sugar." It's bracing in its simplicity. It's a character portrait, period. It's just about psychology and the rhythms of friendship. It starts in Dubuque, Iowa, in the middle of a card game, where a quiet and recessive-seeming man named Gerry (Mendelsohn) first meets a newcomer in town, Curtis (Ryan Reynolds), who has a knack for holding court. He keeps offering to buy Gerry a round of top-shelf whiskey and is so annoyed when Gerry refuses (out of pride, he insists on switching his order to a cheap brand) that he goes back on his promise to pay. Fate seems to want these two men to become friends, and they do become friends, but their relationship reveals itself as something other than what we expect. Curtis has all the outward trappings of a self-destructive but magnetic flake, the kind of man who'd be thought of as a star within his own little community; Gerry seems every inch the put-upon, reactive "loser" character, the guy who'll go along with Curtis' wild schemes and end up regretting it. Aiding the '70s vibe: there are moments where Reynolds' looks and sounds like he could be Richard Dreyfuss' brawny chatterbox of a kid brother, while Mendelsohn's croaky voice and anxious eyes evoke Dustin Hoffman. But within a matter of minutes we've started to get a handle on what's really going on. Curtis actually has, for a hedonistic, gambling, basically rootless drifter, decent judgment. He knows when to quit drinking and quit playing, when not to sleep with one of the many women who find him attractive. He is more or less as he presents himself, he seems to know himself better than Gerry, and in time his concern for Gerry seems borne out of real affection and empathy, not some sinister ulterior motive. He's made a new friend and wants his new friend to be happy. That's it. Gerry, however, is bad news—maybe the worst news, because he genuinely likes Curtis but is a destructive person. Gerry initially comes across as hapless and endearing but is actually passive-aggressive, manipulative, and incapable of controlling his impulses. He can't be happy because when this story begins, he's circling the bottom of the drain. He's divorced and lives alone with his cat and drinks too much and spends what little money he makes as a real estate agent on booze and card games and bets at the local dog track. He's a habitual liar who can't give anyone a straight answer about when how much he's won or lost, or what he needs or wants. He stays out all night with Curtis and crashes at his place and almost blows a showing of a house. He owes tens of thousands of dollars to the local loan shark (Alfre Woodard—not the casting you'd necessarily expect, but what a terrific performance: cool and determined yet understanding of Gerry's troubles). When Gerry insists on joining Curtis as he travels to a poker tournament—with Curtis providing Gerry's stake, of course—"Mississippi Grind" becomes a fairly traditional two-character road film, with stops to win back Gerry's estranged ex-wife ("Deadwood" costar Robin Weigert) and an interlude involving a couple of women (Analeigh Tipton and Sienna Miller) who take an immediate liking to the guys and invite them back to their place, where Gerry reveals an unexpected talent for piano. What we are seeing here is a man, Gerry, who is gambling not just with money, but with what's left of his nearly ruined life, risking everything he's got at every point in the tale for the sake of a long-shot fantasy that he hopes will solve his troubles and redeem him in the eyes of those who've written him off. Unfortunately for Gerry, this is one of those films that's about how life isn't like the movies. Watch Gerry's face as he realizes that his ex-wife isn't just going to leap into his arms and start kissing him, and watch her face as she watches Gerry's face fall beneath the weight of reality. "Mississippi Grind" gains immeasurably from its non-cliched casting. In nine out of ten films with a similar plot, it would be Reynolds in the Gerry part (younger, more conventionally handsome, more energetic, better groomed) and Mendelsohn as Curtis (who at times seems like sort of an older brother figure, looking out for a self-destructive kid sibling). Think of Matt Damon and Edward Norton in "Rounders," or (although it has no major gambling element) Viggo Mortensen and David Morse in "The Indian Runner." This way is better, because it invests the movie with a sense of continual surprise and discovery. Both of these men have more shadings and unexpected, often hidden layers than we thought, and the actors reveal them in pieces, often at moments where you don't expect to be surprised, much less confounded. Curtis is a career-best performance by Reynolds, a smart, self-aware, oddball leading man who's gotten sidetracked into rather thin romantic comedy and action hero roles. Gerry is another keeper by Mendelsohn, a veteran Australian who is credible as a middle-American and is now on the short list of actors who are more exciting to watch when they're sitting at a bar thinking than most actors are when they're firing machine guns at helicopters. The film's characterization masterstroke is really a matter of filmmaking discipline: Boden and Fleck stay on the actors' faces, sometimes in closeup and other times in medium shot, and watch the play of emotions, letting anxious pauses and moments of misunderstanding and delusion hang there rather than cutting the scene for time or filling the background with pointlessly busy action. The movie makes more expressive use of tight closeups and slow zooms and meaningful reflections than any movie since "Inherent Vice." As photographed by Andrij Parekh and edited by Boden, this is a rare American film that is completely and proudly about what happens between people who've decided to be friends but don't know each other, and the discoveries they make as the blanks get filled in. Every friendship is a bet on the future. You never know how it'll turn out.